InFRE’s Certified Retirement Counselor® (CRC®) certification was created to advance recognition among retirement planning professionals of the need for a retirement specific certification program that demonstrates a mastery of subject matter, a commitment to the retirement planning profession, and adherence to a code of ethics and continuing education. Step 1: Complete the Certified Retirement Counselor® (CRC®) Registration Form. Register for no fee either online, by faxing the Registration Form, or calling 847-756-7350 ext. 134 to register over the phone. Following acceptance of your registration application, expect a confirmation email with information about upcoming exam dates and how to schedule your exam. If you do not receive this email within one week of submitting your registration form, please call the number above. Step 2: Prepare for the Examination. Begin to prepare for the exam by first reviewing the CRC® Test Specifications. The four-hour, 200-question multiple-choice exam covers the domains of practice and knowledge required to perform tasks listed in the CRC® Test Specifications, and should be well understood before taking the exam. You may choose to use your own study materials and other resources to prepare for the examination. How the examination pass point is determined. Purchase InFRE’s Study Materials to help you prepare. InFRE offers optional print, and online exam preparation resources to help candidates prepare for the exam. 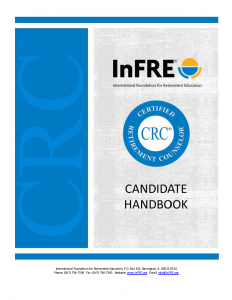 When purchasing InFRE study materials, there is no advantage given to CRC® Candidates related to meeting eligibility requirements, scheduling an exam or any other certification related policies and procedures. You’ll also receive access to the CRC® Elearning Review Courses ($249 value), developed and taught by a team of Certified Financial Planners®, to supplement your self-study preparation for exams. These 38 online sessions, totaling more than 18 hours of content, may be viewed by candidates at their convenience to clarify concepts and answer questions on the more difficult topics. Click here to view a sample. CFP® Continuing Education Credit Certificates. The CRC® 2 & 3 curriculum is approved to meet CFP® continuing education requirements. CFP® credits can be self-reported for free. Step 3: Pass the CRC® Certification Examination. To sit for the exam, complete a Request to Schedule CRC® Examination Form and submit it with your $525 exam fee. You may pay the fee online, or call 847-756-7350 ext. 134 to schedule an exam by phone. The exam is administered four times a year in January, April, July and October at computer based testing centers and you will be able to obtain immediate pass/fail results upon completion. Click here to learn more about the CRC® exam and view the schedule for upcoming exams. Step 4: Complete the Certification Process. Verification that the Candidate meets the education and experience requirements of completion of a bachelor’s degree (or higher), or its equivalent, in any discipline, from an accredited college or university and a minimum of two (2) years relevant retirement related professional experience (within the last five years) -or- completing a high school diploma or its equivalent and five (5) years relevant retirement related professional experience (within the past seven years). InFRE must receive these documents within three months of notification of passing the exam or the Candidate must retest. Candidates are not allowed to use the certification until they have met all the requirements above. Candidates who pass the exam but have not met their education and experience requirements have five (5) years from their exam date to complete these requirements or the Candidate must retest. The Annual Renewal Fee is $140. To maintain your use of the certification, Certificants must annually complete a Certificate Holder’s Statement and submit 15 hours of approved continuing education. CE requirements can typically be fulfilled by attending conferences, attending internal training programs and earning CE for insurance licenses and other licenses and designations. requests for rescores and appeals. For more details pertaining to CRC® certification initial and ongoing requirements and other policies, review the CRC® Program Policies Manual. Confidentiality, security, and record retention policies. Reinstatement of the CRC® Certification. If you have additional questions, please contact InFRE by email or call 847-756-7350 ext. 134.